Nearly four decades ago, when photojournalists still required a darkroom and Kodachrome was my palette of choice, my summers were spent crisscrossing the country, migrating with and documenting what little wildlife was left. After student portfolios were graded and I had recovered from the traditional end of the semester party, I locked my office door in Howell Hall, hooked up the second battery to the DC-powered film and beer fridge in my Chevy Blazer, tested the CB radio (cell phones weren’t practical yet), carefully packed camping supplies onto the roof rack, cameras onto the passenger seat and Donovan, my Old English Sheepdog, into the spacious wayback. In those days SUVs were working trucks, with locking hubs for four-wheel drive, a full sized spare tire on a swing-out tailgate rack and manual transmission. With gas costing $.70/gallon, a small tent, a warm sleeping bag and a Coleman stove and lantern, I could stay on the road for months and I often did. Donovan was an obedience champion sheepdog, with a fancy AKC name: Riches Donovan of Banbury. He was a gift from my parents who had friends who bred sheepdogs. He lived a long life and loved road trips. He experienced more than 40 states and a few Canadian Provinces. I’m not going to say that a large long-haired dog that requires extensive brushing is an ideal traveling companion for a photographer or that it is easy to keep dog hair off my lenses or that he didn’t get excited at times and frighten off my subjects, but overall we had a lot of fun and it was definitely a great way to spend our summers. So, why is any of this relevant almost 40 years later? Because, after dozens of projects in dozens of countries, eight deans and millions of frequent flyer miles later, I’m heading out on my first cross-country road trip in decades. Cynny will ride shotgun, hotel rooms will replace the pup tent that rotted to shreds years ago and my new Ford Escape has more built-in technology than my home computer, but hardly enough ground clearance to allow traversing anything more challenging than a rutted gravel road. The back, however, will once again be reserved for (wo)man’s best friend. Kodiak is ten, almost 11 and only experienced the road when we moved from North Carolina to Florida eight years ago. He’d probably prefer to stay home with a sitter, but I want him to see the country and have the experience of being a road dog. He needs a fancy step to get into and out of what passes for an SUV these days and he can’t go on long hikes anymore, but why grow older at home during the brutal summer heat when you can hang with your people on a cross-country adventure? This isn't a designed photo trip. There are museums and friends to visit and states that Cynny still needs to check off her life list, but there's always room for a camera pack and I'll post a few highlights as time allows for those who care to follow along. Mother's Day dinner of burgers and fries at the Cooter Stew Cafe, St. Marks, FL. 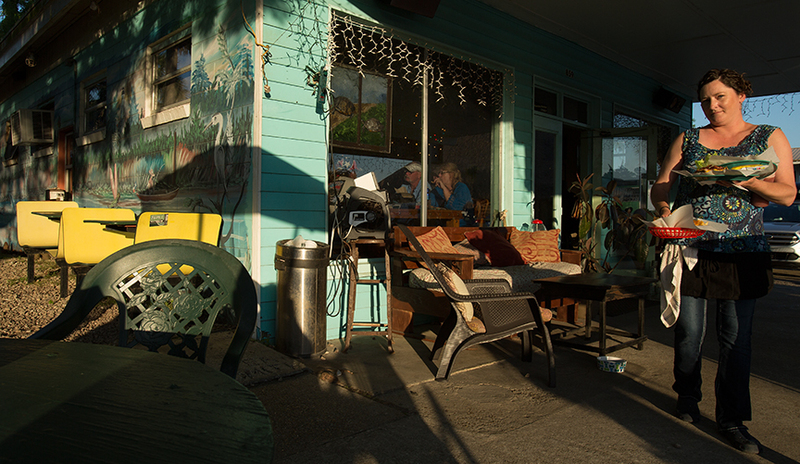 The cafe is directly across the street from the large and loud Riverside Cafe that sits on a branch of the Wakulla River, just a couple of blocks from the San Marcos Apalache Historic State Park. It's Bark in the Park night at MGM Park, home of the Biloxi Shuckers, the Double-A affiliate of the Milwaukee Brewers and a member of the Southern League. 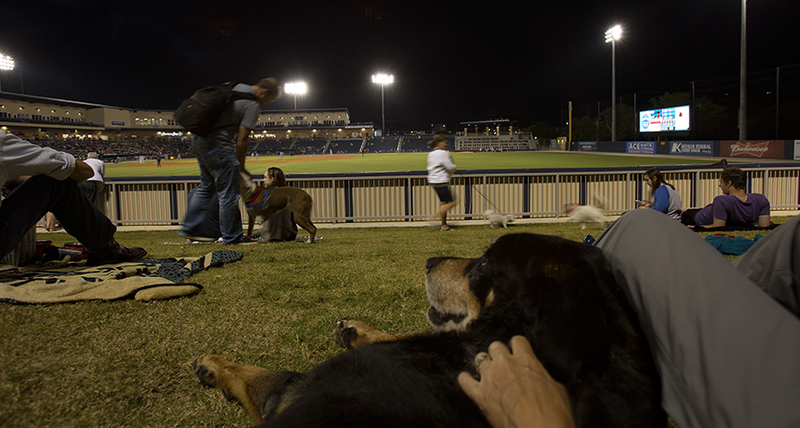 The Shuckers defeated the Jacksonville Suns 9-1 as Kodiak enjoyed the view from the grassy berm behind right field. After the fifth inning of the Biloxi Shuckers vs. Jacksonville Suns baseball game we headed over to the beach to photograph the iconic Biloxi Lighthouse, erected in 1848. It was one of the first cast-iron lighthouses in the South and is located in the median of Highway 90 at Porter Avenue. The waxing crescent moon is just above the cupola. On the morning of August 29, 2005, Hurricane Katrina’s storm surge enveloped a third of the 64-foot tall lighthouse, broke many of the windows in the cupola and destroyed the structure’s electrical system. In March 2010, the city re-opened the lighthouse. After a stopover in Indianola, MS to pay homage to the King at the B.B. King Museum and Delta Interpretive Center, we headed up to Clarksdale, MS and spent the night within a few blocks of Devil's Crossroads, the intersection of Highways 61 and 49, where legend says that Bluesman Robert Johnson sold his soul to the Devil for the ability to play the blues. Eric Clapton has called Johnson "the most important blues singer that ever lived." 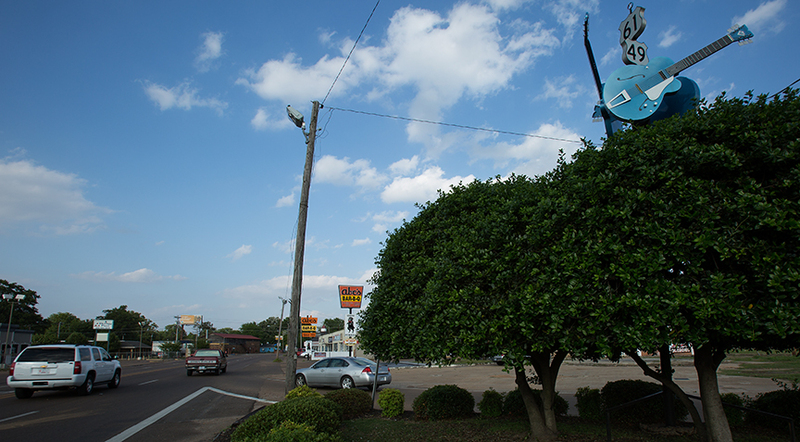 Since 1936, the corner has also been home to Abe's Barbecue, a Delta staple since 1924. Of course, we stopped by for dinner. May 11, 2016: Hot Springs National Park, Hot Springs, AR. 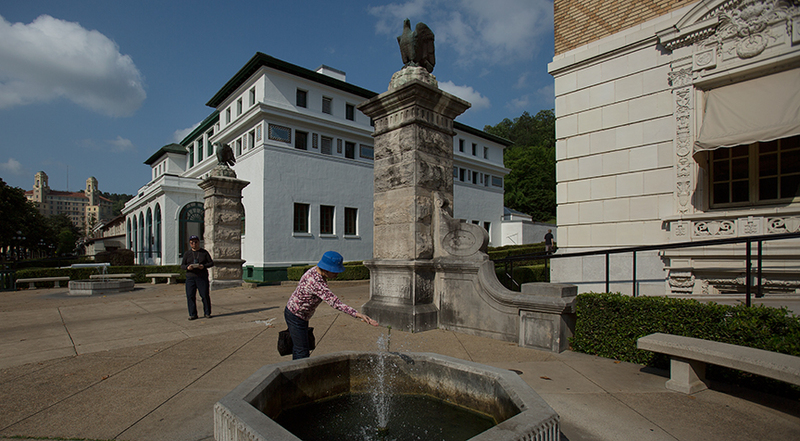 Bathhouse Row is a National Historic Landmark that contains the greatest collection of Gilded Age architecture bathhouses in North America, although only the Buckstaff and Quapaw are still operating as bathhouses. Since 1905, the Ohio Club has been hosting celebrities, gangsters and major league baseball players (who had Spring Training in Hot Springs in the early 1900's) at 336 Central Avenue. Both Al Capone and Babe Ruth were frequent customers. In 1915 Al Jolson performed at the Club and Mae West performed there in the mid 30's. 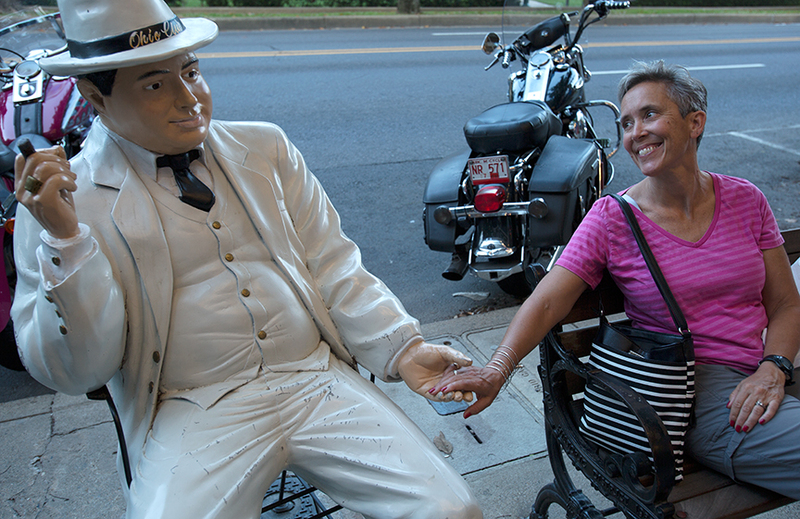 Here, Cynny gets to know Al Capone outside the Club. 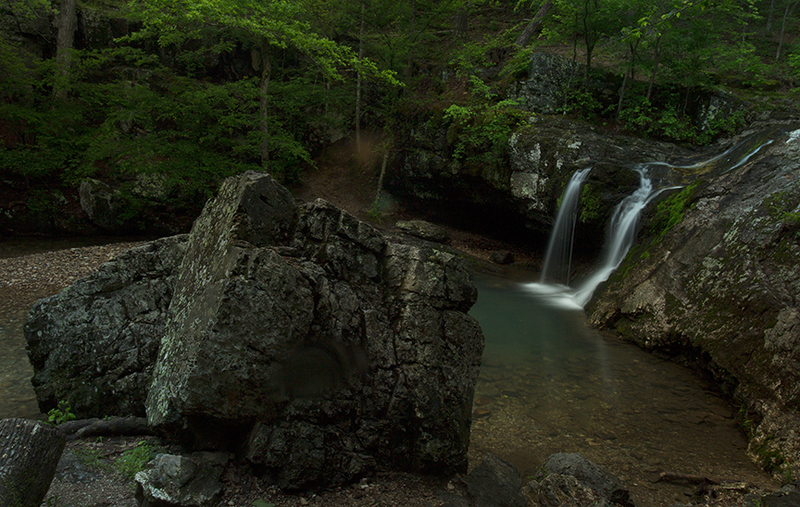 May 12, 2016: Falls Branch Trail, Lake Catherine State Park, Hot Springs, AR. Forgoing over-priced therapeutic bathes and massages, we instead took Kodiak to play in the streams along Falls Branch Trail. May 13, 2016: The Will Rogers Memorial Museum, Claremore, Oklahoma. 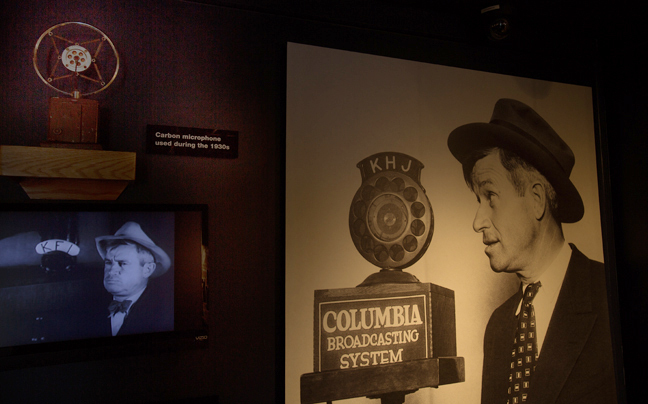 “All I know is what I read in the papers,” was one of Will Rogers’ trademark quips. He was the star of Ziegfeld's Follies, a vaudevillian, a writer whose columns were syndicated by 600+ newspapers, an early radio regular, a movie star and one of the world's greatest storytellers. 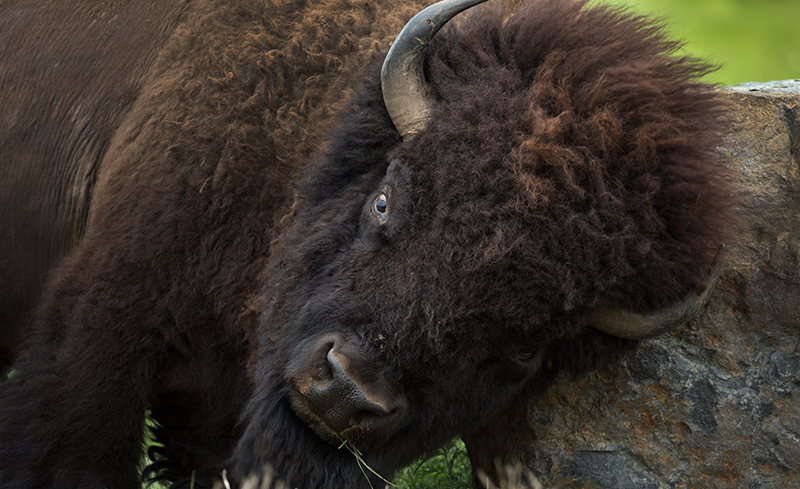 May 14 and 15, 2016: Wichita Mountains National Wildlife Refuge, Lawton, OK.
On May 9, 2016, President Obama made the bison the official mammal of the United States by signing the National Bison Legacy Act. The bison that roam the refuge today are direct descendants of the six bulls and nine cows brought to Oklahoma from the New York Zoological Park, departing by train on October 11, 1907 and arriving seven days later. 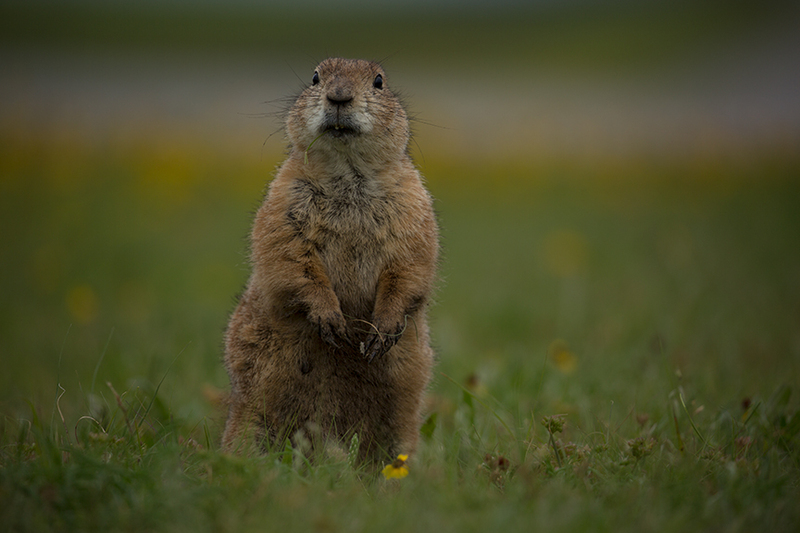 Black-tailed Prairie Dogs are diurnal, burrowing ground squirrels that are common throughout four colonies within the Refuge. Unlike white-tailed, Gunnison and Utah Prairie Dogs they do not hibernate. May 15, 2016: Meer, OK.
Just outside the Wichita Mountains National Wildlife Refuge lies the town of Meers and "The Best Burger in Oklahoma." The population has dwindled from the gold rush peak of 500 down to the present residents: one family of six. 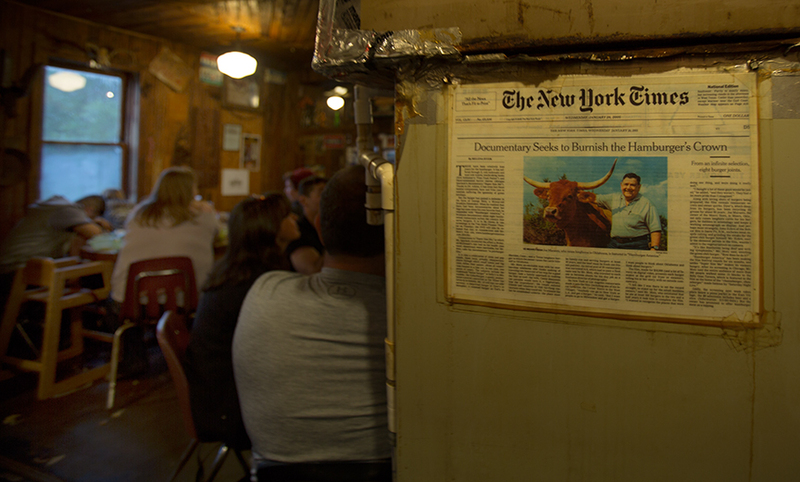 They are famous for their Meersburger, a 7" diameter burger made exclusively from prize-winning Texas Longhorn beef raised on the family ranch. On a rainy Sunday, the restaurant was full and the burgers were inspiring. We also shared an order of homemade vanilla ice cream for dessert. It overflowed a dinner-sized soup bowl. Along Route 66 west of Amarillo, Texas, although no longer in its original location, Cadillac Ranch was built by a group of San Francisco artists known as the Ant Farm for Amarillo billionaire Stanley Marsh in 1974. Ten Cadillacs, from a 1949 Club Sedan to a 1963 Sedan de Ville, were lined up and buried to best show off their tail fins. Cadillac Ranch is not your typical tourist attraction, it is a roadside cult destination and a living art exhibit. When we were there, with a farmer plowing his field a short distance away and a dozen people meandering around spray painting their legacies onto their favorite cars, a naked woman lounged for a local photographer in what remains of the 1949 Club Sedan. 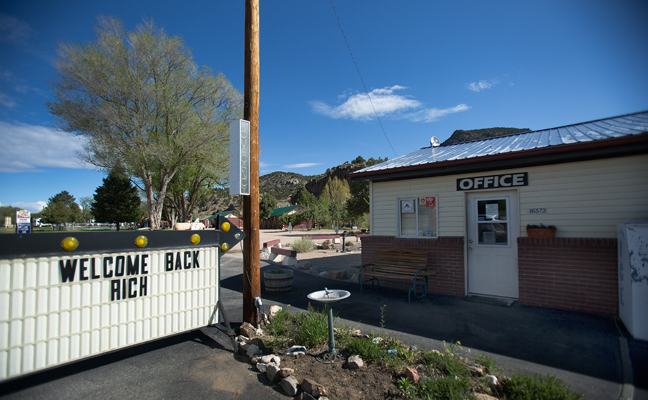 In March 2015, the International Dark-Sky Association designated the adjacent towns of Westcliffe and Silver Cliff, CO as a combined International Dark Sky Community. It is only the 9th community in the world to receive the title. We stopped over on a cloudy and rainy night and settled for the stars and specials at Chappy's Mountain View Bar & Grill. 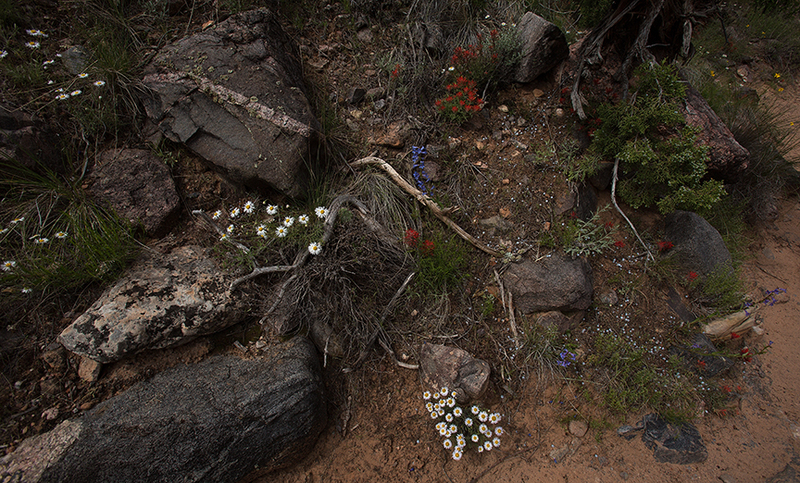 Red, white and blue early spring wildflowers in bloom along the No Thoroughfare Canyon Trail in the Colorado National Monument. 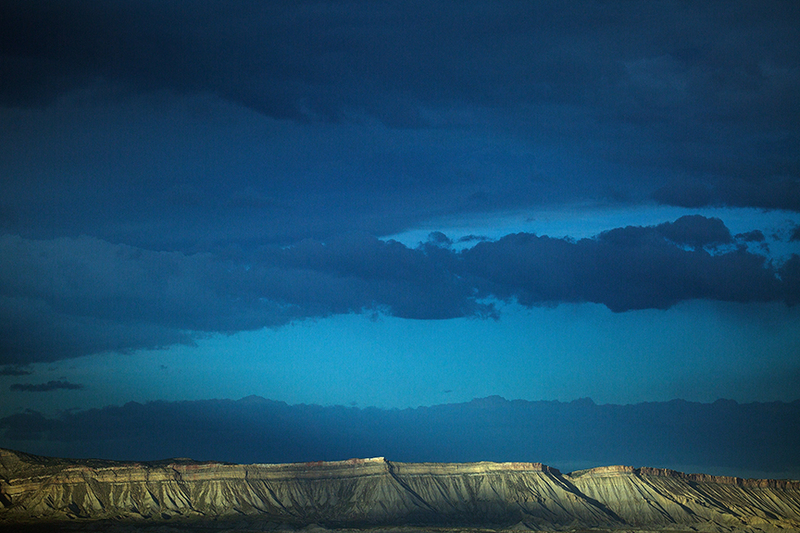 The Monument contains ancient canyons and towering monoliths and lacks the crowds of the nearby national parks. It was established in 1911 by a presidential proclamation from President Taft under the authority of the Antiquities Act. 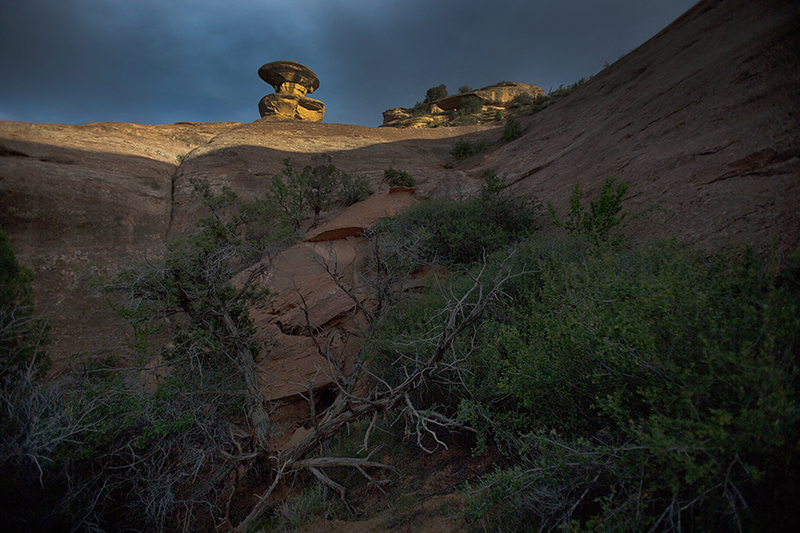 The Cowboy Hat formation is located in the Devils Canyon/Kodels Canyon Towers south of Fruita, Colorado. It is easy to see from the D1 and K1 trails, challenging to find a route to the base and, apparently, a world-class climbing destination. 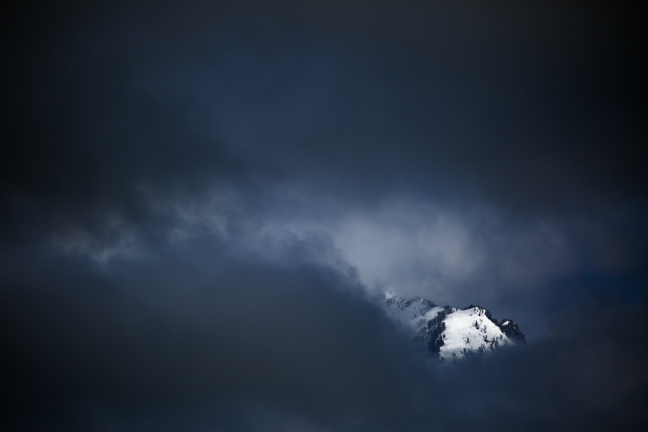 Clouds moved in to Devil's Canyon to obstruct the rising full moon, but a few last rays of sunlight illuminated the mountains to the east of the canyon. 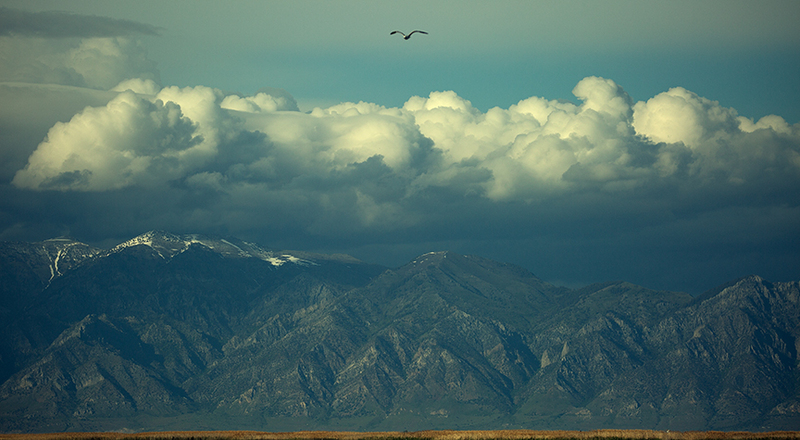 The Refuge encompasses the Bear River as it flows into the northern part of the Great Salt Lake. It contains open water, mudflats, wetlands, uplands and large swarms of hungry mosquitos. 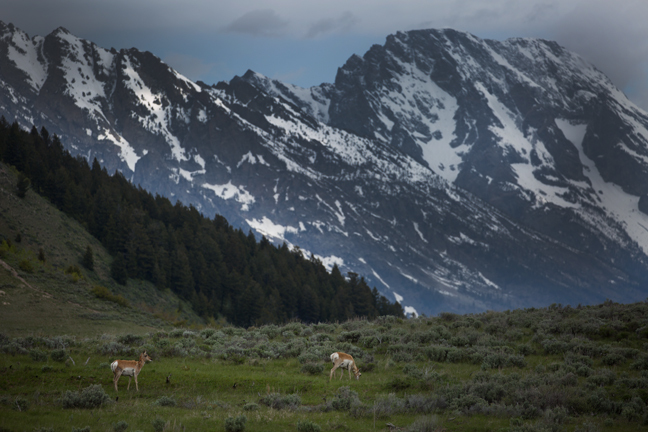 The Refuge contains almost 80,000 acres, although the adjacent lands are occupied by multiple hunting clubs, including the very exclusive Bear River Duck Club, known as the "Millionaire Duck Club." Hunting is also allowed within the refuge for ducks, geese, coots, tundra (whistling) swans, and pheasant. This is not unusual, as hunting is allowed at more than 300 national wildlife refuges and federally protected wetlands. 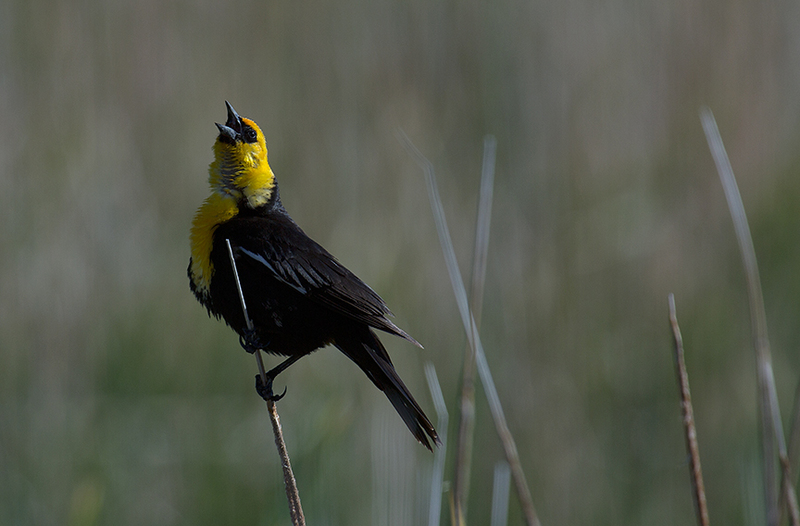 In spring, male Yellow-headed Blackbirds defend a small territory of prime nesting reeds directly over the water and will mate with up to eight females. Their constant aggressive displays and calls dominate the marshlands often displacing smaller Red-Winged Blackbirds. From the campy gateway community of Jackson, WY, we spent a few days exploring the southern end of Grand Teton National Park between the rain, clouds and cold weather. Two Pronghorn Antelope grazed along Gros Ventre Road near Moose Junction. Because dogs aren't permitted on any of the unpaved trails within Grand Teton National Park, we had to find other places where Kodi could enjoy the cool days and beautiful scenery. 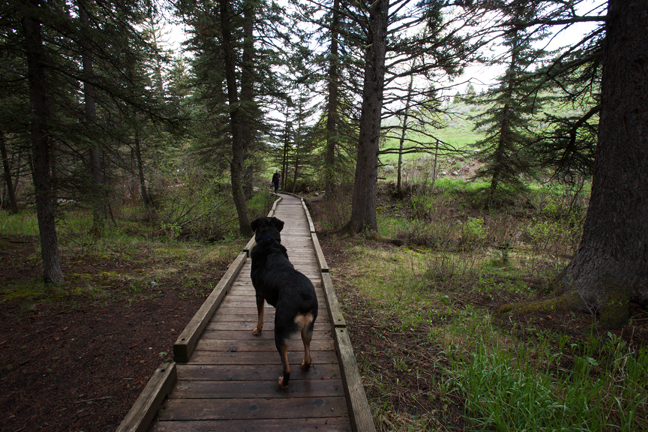 Here, Kodi waits for Cynny to bring our picnic lunch along the Cache Creek Trail just outside of town. For much of the time, heavy clouds and occasional rain blocked mountain views and limited our ability to explore the park. We stayed in Jackson at the Elk Country Inn, which is a lovely inn with yummy fresh cookies at 5 p.m. each afternoon, but you aren't supposed to ever leave your dog alone in the room. You can't take your dog into the park and you can't leave your dog in the Inn, so it wasn't a very pet friendly part of our trip.